These look incredible! You are so creative! these look delicious!! I just had quinoa for the first time yesterday and it was awesome. I want t omake these next. I’m doing weight watchers though so have to figure out the nutritional info and points first! what a treat these will be!! OMG! These are SO CUTE and look SO TASTY!!!!!!! I’ll be my hubby would love these and never miss meat! Hold the phone. These look awesome. Like mind blowingly. I will definitely be making these in some form. I could so skip the bun and eat them like chicken nuggets. Is that wrong? Pinning! I skipped the bun! I added ranch dressing because I needed something to cut the spiciness without the bread. These look wonderful and are making my mouth water! Something about buffalo sauce does that to me. I, too, can’t wait for corn to be in season. I am eating these right now. They are ridiculously yummy. I had a slightly hard time getting them to stick together but I think that was because I was over eager and didn’t let my quinoa cool. Thanks for the awesome recipe!!! Oh. My. God. It appears that you and I share the same obsession over the goodness that is buffalo sauce. These look amazing! Used the base recipe for a mexican version where I used salsa verde as a substitute for the buffalo sauce. Topped the burgers off with avocado and more salsa verde for a meatless burger my wife said was on par with the best restaurant versions she had ever had. Possiblities are endless with this base recipe. I thought my base was too wet, but it worked out. Any thoughts on upping the panko at that point? I am ashamed at how many recipes of yours I’ve made. This one inspired me to try quinoa though. Made these tonight, they were DELICIOUS!! Used Parmesan instead of Romano cheese and they totally rocked!! People even said they liked them MORE then regular burgers!!! Didn’t expect that. Will definitely put this recipe in the top 20. 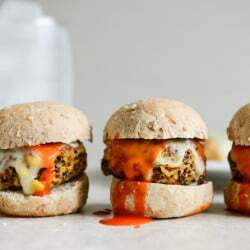 Saw these a couple of days back on pinterest, sounded and looked so delicious. I will be making these soon. made them. loved them. made them full size burgers because those were the buns i had, and had alittle trouble keeping them in one piece but i think if i was more careful and they were slider size it would be so much easier. my husband went back for seconds. 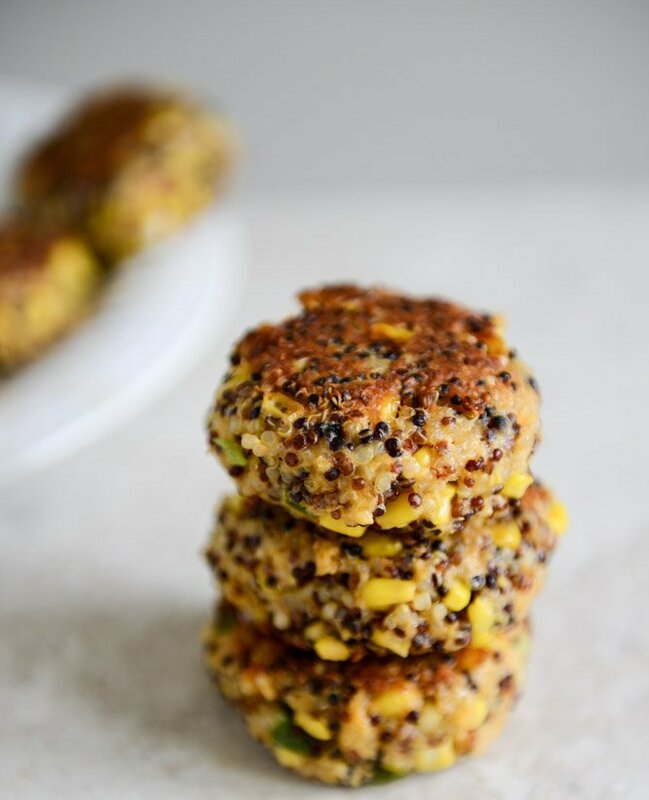 between these and the white bean quinoa burgers you posted, i’ll never buy a veggie burger again. like someone else said, the flavor combos are endless with this or the white bean version base, but i’m not sure i’d change a single thing about what i just ate. Got this recipe forwarded from a friend and OMG! I made them tonight and my husband wants to have them once a week! I also made a kid friendly version minus the buffalo sauce and my 5yr old ate them without even asking what they were! Thanks for sharing! I just wanted to let you know, I made these for my brother and boyfriend weeks ago and they are still talking about them! These are brilliant, one of my favorite recipes by far!!! I love your blog and make quite a few of your recipes so thank you so much for being awesome! Would this work scooping into mini muffin pan & baking so you would have appetizer finger food ? Sounds so yummy! Ok, so I’ve now made these FOUR times for the family and it is now a staple. These are amazing. We are vegetarian, and adore all things spicy. One thing we (I) miss is a good buffalo chicken sandwich. So these are an amazingly better replacement. Well done. Look fabulous! Would they freeze well? And, if so, at what point in the recipe would you freeze the sliders?? 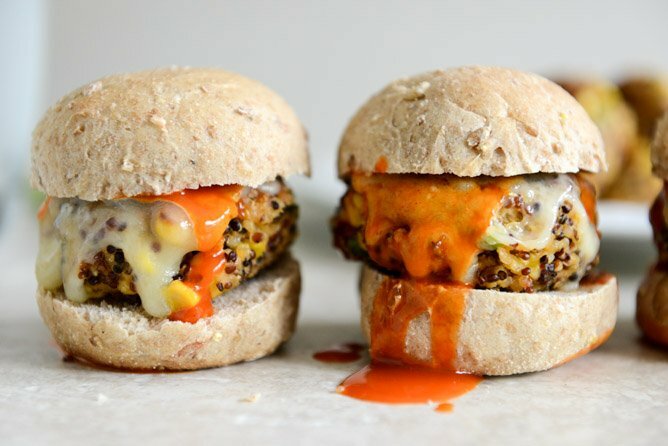 Pingback: Sunday + Quinoa Buffalo Burger | De quelle planète es-tu? can you post nutritional information for those of us on WW so we can calculate the points? Can you try out gluten free options? I love your recipes, but wonder if you can try them out with rice flour or almond flour or whatever instead of wheat/normal flour! WOW. i can’t wait to try this. I made these tonight! They tasted amazing but I could not keep the patties together. Why is there wheat on this site. Read wheat belly. You could be nicer, you know. This is a great recipe. I made them today, & WOW! I made them gluten free by using GF bread crumbs & GF AP flour. Thanks so much. I’ll make them again & again! I ADORED the taste of these, but they completely fell apart! Maybe it’s because I made burger size instead of sliders? Suggestions? Desperate to keep this one in the rotation because it’s so awesome, but gotta keep it together. Also- did anyone else’s corn start exploding all over the kitchen?